Sometimes great things really do come in small packages. Known as the “happy nut” in China and the “smiling nut” in the Middle East, pistachios have a unique, small shape but pack a powerfully nutritious punch. Aside from having a great smile, these vibrant green nuts let you snack your way to good health by containing as much protein as an egg per serving and myriad of other nutrients. They are part of a very nutty, yet irritating family of plants, the evergreen family, which includes mangoes, pistachios, cashews, and yup… poison ivy! Aside from their curious genealogy, pistachio’s incredible health benefits sure give other nuts a run for the money! Stock up on these gloriously green nuts because today on Feb. 26 we celebrate them with National Pistachio Day. Its an excuse for pistachio lovers worldwide to snack on their favorite nut all day long. Try and go nuts today by incorporating pistachios into every meal. These versatile nuts have powerful flavor that can elevate a sweet or savory dish throughout your day. Start off with a stack of pistachio pancakes, ease into lunch with a pistachio, pomegranate, and arugula salad, then enjoy pistachio encrusted salmon for dinner, and top it all off with some pistachio gelato. Check out the endless array of possibilities and go green! Think of ways to food swap some of your not-so-good snacks with pistachios and introduce your friends to these green goodies too. They’re healthy, delicious, and by wrestling them from their shells, they help down your food intake (Ever heard of the Pistachio Effect?). Pistachios might be the golden (green) ticket to helping you and you friends keep those new year diet resolutions. These green nuts will make your heart smile too. 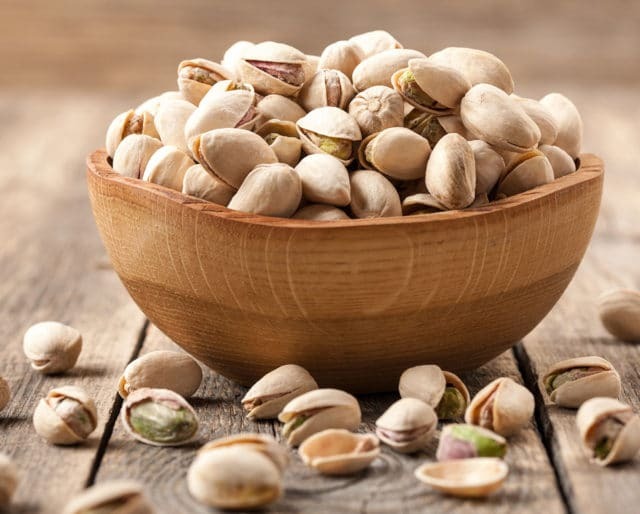 Heart-healthy monounsaturated fat makes up the majority of the fat in pistachios, so they decrease bad cholesterol and even lower your risk of heart disease. There's no better way to celebrate then getting your snack on, guilt-free. Grab a handful (or two) and go nuts! One of the oldest flowering nut trees, pistachios have been enjoyed by humans for at least 9,000 years—they're even one of two nuts mentioned in the Old Testament of the Bible (Genesis 43:11). Clearly, they have a history of good taste. These little treats may be small but they're nutritional powerhouses—they're one of the top three healthiest nuts you can eat! They're relatively low in calories and contain more than 30 different vitamins, minerals, phytonutrients as well as a mix of omega-3 fatty acids, protein, fiber. Snacking on pistachios will help keep you fuller longer and provide you with a serious nutrition boost. Basically, they're an epic power snack. In China, pistachios are known as the "happy nut" because their cracked-open shell makes them look like they're smiling. They're known to be a symbol of health, happiness, and good fortune and are often given as a gift during the Chinese New Year. Who knew pistachios had such beaming personalities?